Man, FFG and you guys are keeping me hoppin' these days! 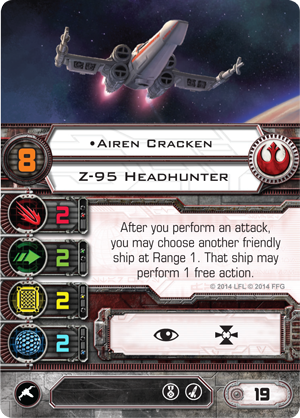 So yesterday FFG revealed some more info on the forthcoming Wave 4 ship, the Rebel Alliance Z-95 Headhunter. Right on, so we've talked about this guy a bit before, but FFG has given us a LOT more info with yesterday's post. To refresh though, here's Frito Bandito to show the ship's stats. As I said before, you gotta give 'em credit- it'll be easy to remember the ship's stats, right? The question on everybody's mind though in that initial reveal, or at least the question on my mind during that initial reveal was, "What's the maneuver dial like though?" Well, FFG dropped it on us yesterday. 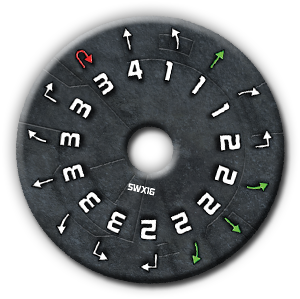 I think most of us know that the Z-95 was Incom's precursor to the X-Wing, so everyone figured the dial would probably be pretty similar, maybe a touch crappier. If you compare the two, they're pretty close to being the same. As for the the actual moves? They're almost 100% identical. The difference being the Z has a 3 K-Turn where the X-Wing's K-Turn is a 4. Aside from that, the only difference is in the colors at speeds 1 and 2. The available speed one moves for an X-Wing are all green where the Z only the straight is green. The available speed two moves for an X-Wing only one is green- the straight 2. The Z has the banks as well. The speed three moves are the same between the two ships save for the Z's K-Turn. Both ships sport a four straight, but the X-Wing has the 4 K-Turn. So not much difference in the dials really. 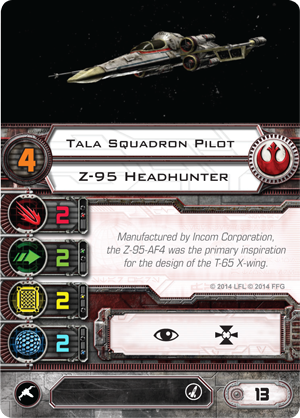 Tala Squadron is the PS 4 version of the Z-95. No upgrades the PS 2 Bandito version doesn't possess, but it's only 1 point more. As there's not much to see there, let's head on to the named guys, shall we? Can't decide if I'm going to call this guy Loo-tennant or Lef-tenant just yet, but I can assure you I'ma definitely call him "Blunt" or "Bluntman" and make a ton of weed jokes when I play with/ against him. All joking aside, well, some joking aside, Bluntman has PS 6 and an Elite Pilot Skill slot for only 17 points which is pretty reasonable in my book when you factor in his card text. Long story short? This guy kills Stealth Devices. Long story long? Notice a few choice verbiage selections there... First thing, "When Attacking..." so this is another one of those instances where we don't care if the attacker is using Primaries or Secondaries, so long as they're attacking. Secondly, Bluntman's card text triggers even if the target doesn't suffer damage. So the way I'm reading this, and admittedly, it's late and I'm not devoting my usual attention to writing this as I promised my oldest I'd print him out some buildings for his Thomas train table before I go to bed and I'm sorta going back and forth between the printer and this article, but it seems to me like this is another one of those deals where you don't even have to hit your target (in the rulebook or local parlance sense of the terms) to trigger the effect. Off the top of my head, I can't think of any other effect this text has other than killing off Stealth Devices and/ or if you couple it with the often under-utilized Assault Missiles, but I'm probably missing something there. That's pretty awesome, but also extremely specialized, so outside of meta where Stealth Devices are heavily used, this guy may not see quite as much action as you might think, but man, he does go a long way to keeping folks honest, doesn't he? The last pilot revealed is a guy by the name of Airen Cracken. Now, while I think you'd be stretching the joke too thin to call Cracken Chronic when he's by himself, I think you're absolutely within the realm of funny referring to Blount and Cracken collectively as Bluntman and Chronic. See, you thought I was going to do a "RELEASE THE CRACKENSZZZ!!!11!!one!!!" joke there, didn't ya? Cracken is PS 8 and costs two more points than Blount for the same available upgrades setup save of course for his card text which is friggin' amazing as you can see from the image above. There aren't a ton of guys who can pull an Action in the Combat Phase. Turd Ferguson springs to mind, and Dreis and Dutch both sort of do it, but Cracken straight up allows another ship at Range 1 to perform a Free Action after he attacks, which being PS 8, it shouldn't be too hard to find a grateful recipient of that kind of love. There are tons of different applications for this text that spring to mind, but the two that jumped out at me first is giving Biggs a Free Action to either Focus or kick on an equipped R2-F2 could really shake up some plans for your opponent, or for pitching somebody carrying Expose as an Elite Pilot Skill that managed to get into a choice position to fire on somebody with little chance of negative repercussion. Or just simply tossing another Z-95 with a Target Lock a Focus token so he can make his Missile salvo really count. Or tossing it to another missile/ torpedo carrier who just got a lot more dangerous. All for the cost of a prototype A-Wing? Sign me up- that guy's good. Nevermind the fact that you could even throw on an Elite Pilot Skill like Swarm Tactics as the dude is PS 8. Does he come with a bullseye painted on the back of his ship? He oughta- he's basically Vader + Squad Leader without having to pay for Squad Leader. Just make sure you put him in a position where he can attack and you're in good shape- doesn't matter if he actually connects or not, just give him a target. Of course, flying against him, you gotta kinda treat him like Garven Dreis and stay out of his arcs to nullify him. The tough thing with Cracken is he's so much cheaper than Dreis and his ability is so much better. 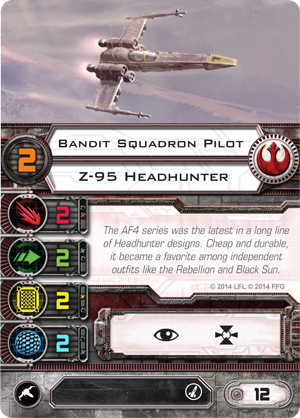 In addition to showing us the dial and all the available pilots, FFG did us yet another solid by revealing some more upgrade cards too. This is one of those cards that I can't quite decide if I'm overvaluing it or it really is as awesome as I think it is, but first, one of my trademark digressions. 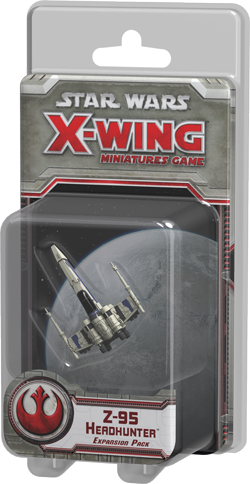 I think FFG really is concerned with keeping X-Wing balanced. It's just my opinion, of course, but I think they really are trying hard to avoid a single style of list dominating the meta without completely throwing the rest of the game out of whack. That said, I think they're really tired of TIE Swarms being so good. I think they tried to address them with Assault Missiles, but they were a little too expensive to catch on and of course were really only available to the Rebels on a couple of ships anyway, so they didn't have the meta-shaking effect that FFG was going for. Wave 3 I think they hoped the B-Wings would further pound the TIE Swarm, and they kinda do, but as we've all seen in our Store Championships, the old school Wave 1 classic TIE Swarm is still very forgiving to those who can maneuver it, so the effect was still somewhat lost. Wave 4 they're aiming to change that once again with cards like this. First off, it's a Mod so you can stick it on anybody you want. Secondly, it's only a point, so it's tough not to justify. 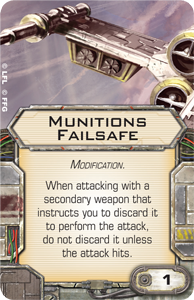 Third, the card text gives kind of a Han Solo card text-like effect to Secondaries you discard to perform the Attack, so Missiles and Torps in other words (no, not Bombs- they're not Secondaries, remember?). As the trigger criteria involves the attack hitting, I'm obligated once again to run through the difference in die results and Hits, but as I've said it on here a bunch of times, I'll just do the short version- when you make your attack, and your opponent makes his defense roll, if you have more filled and/ or unfilled explosion symbols on your red dice than he has wavy arrows, Evade tokens, or modifications like Focus on his dice, then you've Hit him. It's not if you just roll filled or unfilled explosions- your Attack has to actually get through his attempt to cancel your attack results. If that doesn't happen, Munitions Failsafe kicks in and you don't actually discard your ordnance. Defending against this is kinda like that contextual modification stuff you get into when Han shoots at you, but the bearer of Munitions Failsafe doesn't get to attack again, he just doesn't use his Missiles or Torps on you which might be fine, but it might not either. Like I said, it's contextual. I kinda wonder if they're going to FAQ this card's use with Cluster Missiles or leave it the way it seems to be right now. 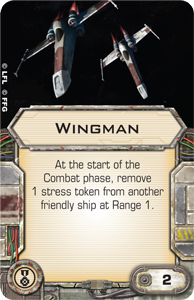 Last new card revealed is Wingman which I think all of us were pretty curious about. Wow, so that's pretty awesome too, right? Notice though that this is an Elite Pilot Skill, so you can't just tack it onto anybody like Munitions Failsafe, but still, it's pretty slick if you like puling K-Turns, using Push The Limit, Elusiveness, or a surprise Opportunist on your opponent. This is another one of those cards that I can't quite decide if I'm thinking it's a bigger deal than what it is or if it's the game changer I believe it to be. The thing I love is it just straight up removes Stress Tokens as opposed to just moving them around like with Captain Yorr. 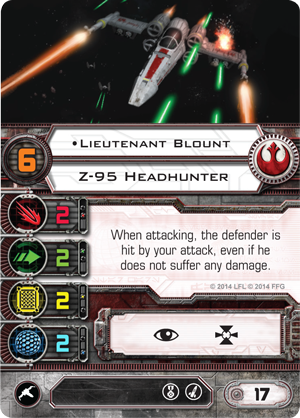 Admittedly, they're removed in the Combat Phase, so you may have already cost yourself your Perform Action step, but for Advanced Sensor B-Wings, this card is a big deal.